LIVE Google Hangout — watch now! Rob – If the Seahawks have a “successful” offseason (define however you’d like), what’s a realistic expectation for next season? Any word on W. Dissly’s recovery? Jamarco Jones? Any sense of Darboh’s future? Thoughts on Rasheem Green? Which current Seahawks will be extended this coming offseason? Earl T to be a Seahawk or not? Doubt if Earl returns. Expect it would be only if Seattle wants him and nobody else does. What are your thoughts on Jarran Reed this year? Do you think his sack numbers are sustainable or is just a career year and he will go back to 1 or 2 sacks a year? Do you see any need to draft OG this year (later on in the draft)? Or do you feel comfortable resigning Fluker/Sweezy and then rolling with Hunt, Pocic, and Simmons as back ups? Should be good to go then. What do you think PCJS do with the TE position gearing up for the 2019 season? Do they hope Dissly makes a full recovery and roll with Dickson, Dissly and Vannett or draft one if they are able to gain additional picks? Extend Vannett or let him play out final year of contract? What is your opinion on the TE draft class as well? Rob the Hawks have a ton of free agents this off season. Who would you prioritize to re-sign for the Hawks this off season. Also anyone your would try to extend early? PC says KJ Wright will not play Sunday. Also Hawks officially active McKissic. Do the problems stopping the run lead you to believe a run-stuffing DT could be a possibility late Day 2 or early Day 3? Or do you think this will be an area more likely they focus on in FA? Possibilities for each? In regards to a run stuffing D.T. I have a couple of thoughts on that. Now it has not worked this year. However, John Schneider has had success in finding free agent run stuffing DTs. I thnk one of the main issues is at linebacker. You have Bobby Wagner and that’s about it. K.J. Wright has been M.I.A. all year. Micheal Kendricks seemed to play well. But correct me if I am wrong but the run defense was not this bad when Kendricks was playing. Kendricks will be back against the Vikings. I will be really interested to seem how the run defense performs with Kendricks back in the fold. What is going on with Naz Jones? Great listen as usual Rob. You don’t need guests but when you have them go for high quality. Between FA & the draft the market seems to be flooded with DL talent. The table is set. Any chance of a regular podcast Rob? That would be a real treat. Practically all of the Seahawk 2019 Free Agents will be resigned on cheap deals and will compete with new Free Agents and New Draft picks for roster spots. I don’t see us tying up big $$ in contracts in 2019. Besides extending RW & BW I think we will be playing small ball in 2019. Another fantastic google hangout they are truly highlights of my day. I enjoy the google hangouts during the season with you alone and your insights but would really like very special guests like Tony Pauline as it gets closer to the draft. Rob, you didn’t mention Jeffrey Simmons at all. Where do you see him as a talent (if there is no red flags for beating a women)? Beating a woman IS a red flag. He’ll be excluded from many draft boards. Probably not the Redskins, though. I really enjoy these hangouts, Rob. Please keep them coming. I enjoy the solo effort rather than guests, personally. Really enjoyed listening when I got home last night. Guests for guests sake aren’t important to me I come for your insight. But if you feel someone offers a unusual or contrasting insight that might be of interest. You are a practiced speaker and sometimes guests can posses good knowledge but they not the format down by how they present. Thank you so much for the time and effort you put in. Thanks Seahawcrates… appreciate that! And thanks for the feedback. Really excited to listen to this later. The Seahawks page on ESPN has a nice little article on David Moore this morning. A few nuggets that I don’t think I’d heard anywhere before like the fact that he was on their radar already during his junior season and Aaron Hineline (the area scout at the time for SEA who also landed Carson that year and scouted Tre Flowers) had Moore hand timed at 4.37 in the 40. That’s really good at his size. Pete keeps talking about his RAC ability which we haven’t really seen yet, and that’s the thing I’m most looking forward to developing. I like the Tate comparisons, but as I’ve said before he has a really similar body type and athletic profile to Andre Johnson. Interesting to finally find out it was the Colts that forced Seattle to activate and stash Moore on the 53-man roster mid-late last season. I think the most surprising thing about Moore this year is just how much Wilson trusts him to win a 50/50 ball. Russ is usually reticent to throw into those sort of windows but it seems like he backs Moore to win those contested catches. Moore’s strength (using bench press figures), size, reliability and toughness must make Russ more confident throwing to him.Then knowing he’s got equally sure-handed NoE and Baldwin as options even more confident. Then there’s the Oline giving him time. And of course the run game to back that up. On a receiver’s note, does Pete’s son deserve some credit for his position coaching? As for whether I prefer the solo appearances or hangouts with a guest, I could go either way, but having guests like Tony Pauline and other draft insiders would be great as well as well since they have connections to NFL scouts and have really good, credible information. I saw that CBS mock that you were mentioning and I had a good laugh at that one. As you said, some people seem to be trying to be too clever. People like tony don’t seem to fall into that trap and base their mocks and rankings based on sources within the NFL scouting community and are trying to reflect reality of what NFL teams actually think. That is terrific information, and I’d love to hear more of that kind of stuff. Great, thanks for the feedback. I will definitely be doing a piece with Tony before the draft, maybe even a couple of pieces. CBS is like crash t.v. Or WWE in the attitude era. Just straight grabage, but you can’t look away. Highly entertaining for me. Being too clever. That’s a mock draft in general. You’ll always over think things. There’s no way to remotely know how 32 different teams will act. 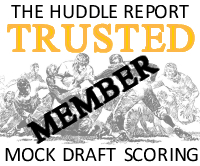 And if a mock is based on what what you would do, well now your assigning needs for specific teams and a lot might just go BPA. Point is, these are all for fun even if some are just laughably embarrassing no? A touch late, but some good stuff here. Might re-post if Rob puts up a new article shortly. –	Take advantage of stretch of home games. –	Kyle Shanahan always does a great job on offense. They are a run-first team. They run outside zone. Breida is really fast. –	They are giving up 100yds/game rushing, so we need to do a good job rushing. –	Mullen has been efficient and they are good at moving him out of the pocket. Has only been sacked 4 times in 100 throws. –	Rivalry still on with 49ers? PC has never thought that way. Each week has to be the same challenge. But there were some great battles with Harbaugh in both college and pros, and the better the opponents are, the better it brings out of you. –	Kittle´s success is both on him being a good player, as well as coaches putting him in position to succeed. Was a great prospect coming out. –	Similarities and differences between two young NFCW HC in McVay and Shanahan? Both grew up under Mike Shanahan. Run game is same foundation. Then cool to see how each has branched out and become their own style. –	What is RS´s legacy in Seattle? Consistent high level of play year after year. –	Did PC think he would play here forever? He thinks that about all our guys. He´s “all in”. –	What kind of reception can RS expect on return? If it´s noticeable, then that´s already something special. –	Disappointed on how it ended with him? They were in really close communication as he was working through everything. Haven´t been in touch since. –	How did PC feel about RS´s critical comments (“PC losing his way”, etc.). RS needed to change allegiance and PC could care less about it. –	Was it difficult to manage him? Yes, like lots of our guys, it was a challenge. Tremendous competitiveness and huge respect for him. “Every moment was worth it”. –	What has PC learned in general about how much slack to give guys like that? “Give him all I got.” Can´t take it generically with superstars, but case by case. It´s not “slack”, but allowing them to be themselves, and was absolutely worth it. –	Greatest memory of RS? On the field, The Tip. Off the field, just talking to him on so many occasions about RS plans and how he wanted to go about handling things into the future. –	Biggest challenge in managing him? Not sure, just like with all, really understanding them. –	Did RS´s perspective and intelligence challenge PC´s authority? It pushed the limits because he sees beyond what others might be limited by, and that´s part of what made him special. It wasn´t just a challenge, but a blessing. –	When does that become too much to manage? When it´s no longer about the team, the brotherhood. Not that that happened with RS, but that´s the general rule. –	Does PC use RS film to teach Tre and Shaq? Of course. –	Tre Flowers development at this point compared to RS´s? Flowers has been unique in attacking the football. Safety toughness has carried over. Will reserve judgement until able to analyze it fully after the season. Said he also did an in-depth analysis last season of Shaq´s development compared to Sherm´s. –	Shaq´s recent play? Just the ups and downs of being a CB in the NFL. You´re going to get thrown at a bit. Just important how you bounce back and move forward. –	Will ADB be fighting through injuries the rest of the year? He´s feeling better. (ADB specifically told him not to tell media he was “the best he has felt”. 😊) PC and doctors don´t know how he played through that groin strain. Impossible for sprinter-type athletes. Basically heroic to even want to be out there, let alone actually do it. –	Kam has been super helpful and has been around. Earl has been “out of town”. –	McKissic is back. Won´t reveal how they plan to get him involved. –	Tre Madden is sore (joint injury), will go up to game time. –	McCaffrey´s pick play TD? Just too many guys running into each other to make a call. League confirmed they see it different than the Hawks did and would make the same call again. There was definitely some design there, but we will just have to find a way to avoid the collisions. –	Washington vs. Utah? Huskies. This is awesome thanks again! Good stuff with these as always. Looking forward to seeing the fan response to Sherman in the stadium Sunday. Can’t wait to see the matchups. Sherm on Baldwin, Lockett, Moore. He’s been good when he’s played this year, but whoever is across from him at CB has been consistently beaten like a rented mule. A lot of yardage to be gained there. I want to see him beaten for a touchdown. Handsomely. And I want a crushing Seahawks victory, plus a shut-out. Not so sure this game is going to be the huge walkover everyone expects. Looking at the stats, the 49ers can run the ball. Their rushing stats are comparable to the Hawks. On defense, yards per rush they are 8th the Hawks are 32nd. Hope the Hawks aren’t taking this game for granted. It’ll be cool to see Sherm back in Seattle. And then Baldwin or Lockett will break his ankles. I want Lockett to do it. LSU LB Devin White rides a horse around campus? My man deserves to be a top 10 pick based solely off of that. Choose the better pass rushing duo. I think I’d go for Miller and Chubb. But Watt and Clowney at their best are pretty much as good as it’ll ever get in terms of a duo. Healthy?? Has to be Watt and Clowney. Just watched the Cowboys take down the Saints. Looks like the Cowboys are on their way to winning the East. If the Hawks make the playoff’s it will be exceedingly difficult to beat the Cowboys a second time, especially in their house. That is a bummer for me, nothing I hate worse than losing to the Cowboys and Packers.